To Cite: Faiz H R, Imani F, Entezary S R, Ziaifard M, Koleini Z S, et al. Adding 5% Dextrose Water to Bupivacaine in Ultrasound-Guided Axillary Brachial Plexus Block, Ann Anesth Crit Care . 2016 ; 1(1):e8313. doi: 10.5812/aacc.8313. Aim and Background: Axillary block is a common practiced anesthesia technique for upper limb surgeries. The aim of this study was to evaluate the effect of using 5% dextrose as a diluent compared to normal saline in upper limb surgeries. Methods: In this clinical trial, 60 patients scheduled for upper extremity surgery, were randomly allocated to bupivacaine 0.5 % (20 cc) + normal saline (20 cc) (BN group) and bupivacaine 0.5% (20 cc) + dextrose water 5% (20 cc) (BD group). Evaluation of motor and sensory block was performed every 5 minutes for the first 30 minutes, then every 10 minutes for another 30 minutes and every 15 minutes till the end of the surgery and compared between groups. Results: Time required for sensory block for the median nerve was significantly less in the BD group (19.8 and plusmn; 9.3 vs. 26.6 and plusmn; 14.0). Onset of complete motor block did not achieve any significant difference between groups. Conclusions: Dilution with 5% dextrose provides earlier onset of sensory block for the median nerve with bupivacaine 0.5% compared to normal saline. Axillary block is a common technique in regional anesthesia performed for upper extremity surgeries (1-3). Performing this block in patients with difficult airway and underlying comorbid disease is believed to be beneficial. However, the time gap between block administration and adequate analgesia is a complaint, especially for surgeons. The use of adjuvants and local anesthetic has been proposed for this shortcoming (2, 3). Adding solutions to local anesthetics is also assumed to be an option (4). Normal saline is the most widely used diluent in axillary block. Due to the interference of saline with sodium channels and regression of peripheral blocks, the use of other diluents, like 5% dextrose water has been proposed. Moreover, this substance is soluble and does not cause pain and residual complications overtime (5, 6). 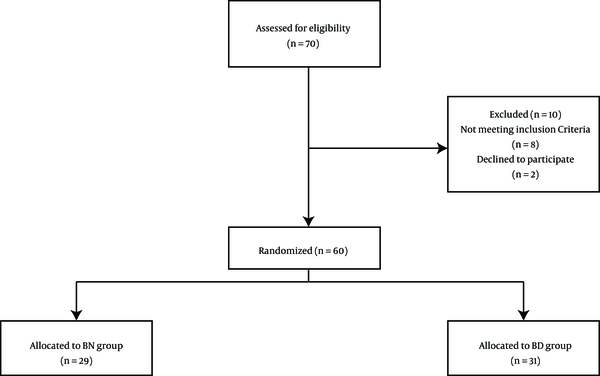 This study was designed to evaluate the effect of adding dextrose water 5% to bupivacaine in axillary block under sonography and nerve stimulation in surgeries below the elbow. Exclusion criteria were previous history of allergy to anesthetic drugs, contraindications for peripheral nerve block, scar or infection at the blockade puncture site, neurologic deficit, pregnancy, addiction to alcohol or substance use and unsuccessful block. After enrollment with regards to the inclusion and exclusion criteria, the patients were randomly divided with blocking randomizing technique, in blocks of 4 and to 2 groups. Participants were subjected to receive bupivacaine 0.5% (20 cc) + normal saline (20 cc) in the BN group and bupivacaine 0.5% (20 cc) + dextrose water 5% (20 cc) in the BD group. In a supine position, all patients were monitored with and electrocardiogram, pulse oximetry, and none invasive blood pressure control. Peripheral catheterization for crystalloid infusion and oxygen via mask was also applied. With the patient entering the OR and under standard patient monitoring, 20 µg of midazolam and 3 µg of fentanyl per kg of the patient’s body weight were prescribed as premedication. Patients in the BN group received 20 cc bupivacaine-Mylan® 0.5% diluted with 20 cc of saline solution whereas their counterparts in the BD group were subjected to 20 cc bupivacaine-Mylan® 0.5% diluted with 20 cc dextrose water 5%. Axillary block was performed with the use of ultrasound (linear transducer 6 - 13 MHZ, Sonosite®, Bothell, WA, USA) and a peripheral nerve stimulator (Stimuplex®, B Braun, Melsungen, Germany). In line with the approach, a 50-mm *22G needle was used. Radial, ulnar, median and musculocutaneous nerves were blocked, respectively. Hemodynamic values, were measured and recorded every 15 minutes for all participants. In order to evaluate the sensory block, the pinprick test was used every 5 minutes until total analgesia was obtained in all four nerve distributions. Data was recorded as follow: 0: no block, 1: partial block, 2: complete loss of sensation to pinprick. Regarding motor block thumb opposition for median nerve, thumb adduction for ulnar nerve, thumb abduction or elbow extension for radial nerve and flexion of elbow for musculocutaneous nerve was recorded. Motor evaluation was conducted using a three-point scale where two = normal movement, one = paresis with some movement possible, and zero = total paralysis. Motor and sensory block was recorded every 5 minutes for the first 30 minutes, then every 10 minutes for another 30 minutes and every 15 minutes till the end of the surgery. The statistical package for social science (SPSS) for windows, version 21.0 (Chicago, IL, USA) was used for all analysis. Student’s t-test was used to examine differences between continuous variables and Chi square for categorical variables. Differences between groups were compared with repeated measurements of analysis of variance (ANOVA). P values less than 0.05 were considered statistically significant. From 70 patients, 10 dropped out while 8 did not meet our inclusion criteria and 2 declined to participate, resulting 31 patients in the BD group and 29 in the BN group (Figure 1). Among the basic values, the mean age of the BD group was 11 ± 2.3 years, and mean age of the BN group was 8 ± 8.26 years; (P = 0.08), thus no significant difference was displayed. Other demographic and baseline characteristics also revealed no statistical differences (Table 1). BN, Bupivacaine 0.5%- normal saline; BD, Bupivacaine 0.5%- dextrose 5%. Although in both groups a decrease in heart rate trend was investigated, there were no statistical differences in the mean heart rate between groups (P value = 0.1) (Table 2). Similarly, for mean systolic and diastolic blood pressure no significant differences were observed (P = 0.06 and 0.11 respectively) (Table 2). Table 3 lists the mean time required for sensory block in each group, which revealed no statistically differences between groups except for median nerve block (P = 0.03). Regarding motor block, no statistical difference was observed between groups (Table 4). Our study suggests that 5% dextrose water added to bupivacaine 0.5% statistically improves the sensory block time for the median nerve. Additionally, no hemodynamic difference was observed between groups. In a similar study using 5% dextrose as an adjuvant to bupivacaine 1%, early onset of brachial block in upper limb surgeries was shown. In our study all patients gained complete motor block in 30 minutes, however in the same study 83.1% of the patients in dextrose and 74.6% in normal saline group gained complete motor block (5). Regional anesthesia compared to general anesthesia resulted in patient’s satisfaction along with fewer complications, such as cognitive impairments (7). In patients with unstable hemodynamic, malignant hyperthermia, post-operative nausea and vomiting and patients who are high risk for general anesthesia, peripheral nerve blocks could be a wise choice (8, 9). Local anesthesia also results in postoperative movement, less intraoperative bleeding (20% - 50%) and a more stable coagulation condition during surgery. Therefore brachial plexus block serves as a reliable and safe option in upper limb surgeries (9, 10). In different studies, success rate in axillary block has been reported from 37% to 100%, which has been based on the surgical evaluation (6, 11-15). Previous studies have been conducted in order to evaluate the effect of different adjuvants in axillary block. In a study conducted in 2015, a faster onset time for supraclavicular block with dextrose water as a solute was indicated (6). Another study suggested that adding morphine 0.1 mg /kg resulted in increased sensory block without complications (14). Fentanyl was also used in adjuvant to articaine with the same results (15). Moreover, dexamethasone added to lidocaine caused increased sensory block compared to fentanyl (16). Magnesium sulfate also increased sensory block in adjuvant to prilocaine (17) and lidocaine (18). Sanderson et al. revealed that adding dextrose to local anesthetics increases the local anesthetic density therefore resulting in a long and high quality sensory block (13). Normal saline is an isotonic solution widely used as a solute for local anesthetics in order to increase the injection volume. Every 100 milliliters of normal saline consist of 0.9 grams of chloride sodium. When normal saline is used as a diluent, sodium ions concentration in the local anesthetic is increased therefore the analgesic effect may be influenced. High concentrations of sodium around neurons introduces local anesthetic uptake in binding sites (5). Therefore, normal saline used as a diluent will affect the beginning and recovery of the block. Furthermore, 5% Dextrose is a hypotonic solute, which contains 50 grams of glucose in 1 liter. The use of dextrose does not change the sodium concentration in the solute (5). One limitation of this study was that when evaluating the sensory and motor block we did not consider the sequence of the nerves. Furthermore careful measurement of the size of the nerves is suggested as it might influence the onset and duration of the block. This randomized clinical trial showed that dilution with 5% dextrose in water provides a significantly quicker onset of sensory block for the median nerve with bupivacaine with no hemodynamic changes, during axillary brachial plexus compared to normal saline. Further possible benefits of different solutes in brachial plexus block should be evaluated with larger sample size in future clinical trials.